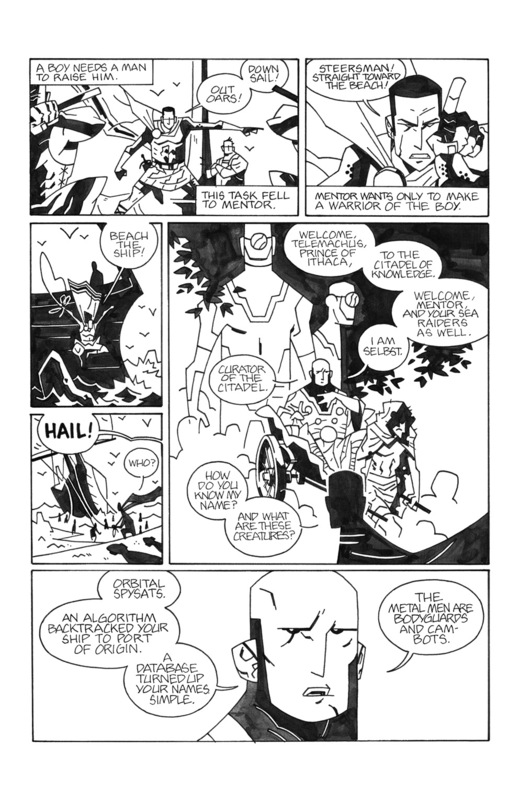 Artist Joe DellaGatta wanted to share the work that went into bringing a page of science fiction author Michael Swanwick’s first-ever (fantastic) comic script, “The Long Bow” (starring Telemachus), to life. Click on any image below to see it bigger. So, here’s a bit of my process. It’s usually the same, project to project. After reading the script, written by Michael Swanwick, I begin to do tiny layouts. Roughly 1” x 1.5”. 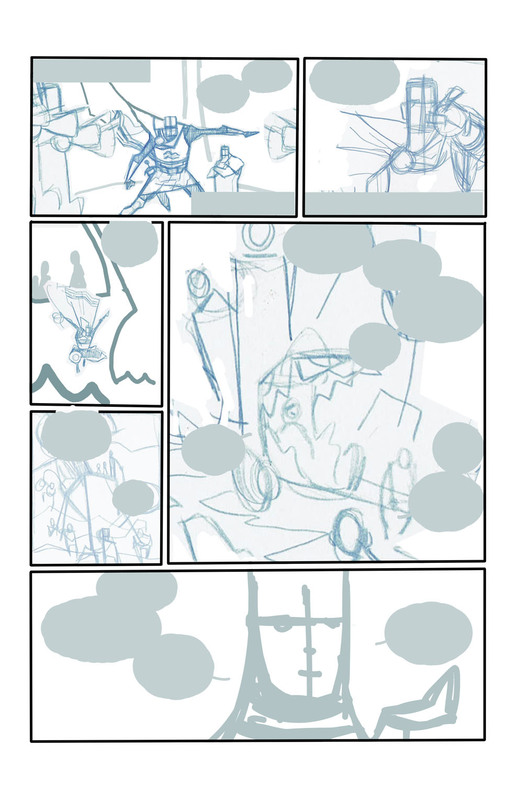 This allows me to focus on basic shapes, flow of panels, panel sizes, and a rough idea of lettering space needed. This is before I gather any reference, or develop any designs. After the thumbnail stage, I’ll do a quick pass at all the lettering. I enjoy doing this myself on smaller stories, and, I like to see hand lettering on pages. It doesn’t happen too often these days. This stage also allows me to reassess my page layouts, and see if I need more or less space in certain panels to accommodate the balloons/captions. 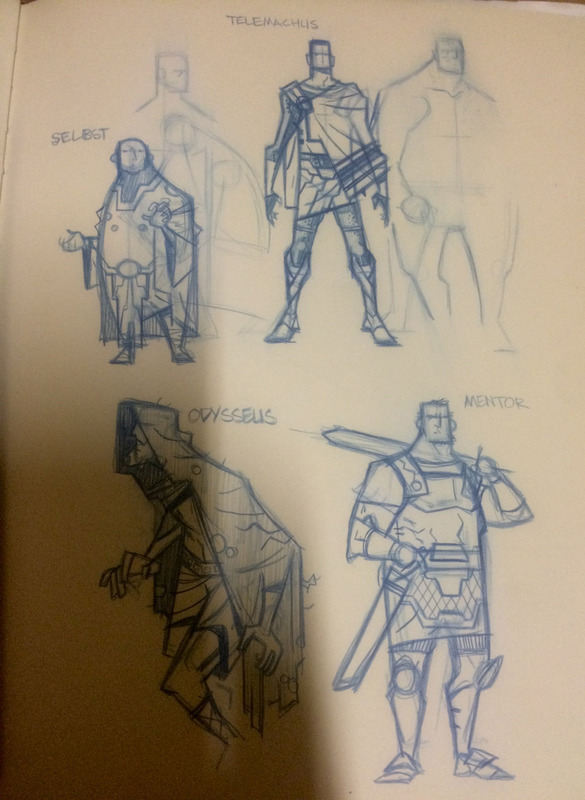 These are my quick passes at the character designs from the story. I asked Michael for a brief, physical description of each character, then started to come up with their looks. I tried to incorporate a little fashion sense from Ancient Greece, and a VERY simplified Kirby influence to some of the clothing. 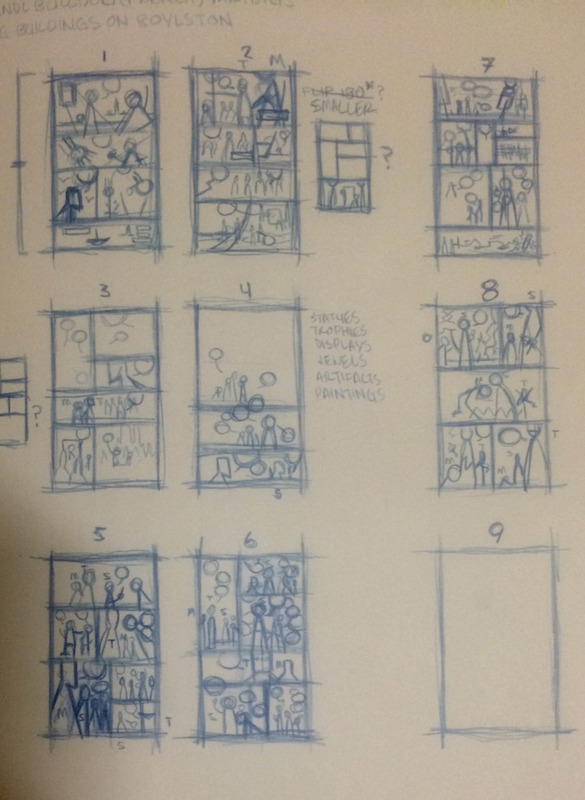 At this point, I’ll scan in my tiny thumbnails, and enlarge them to the full size I’ll be drawing at. 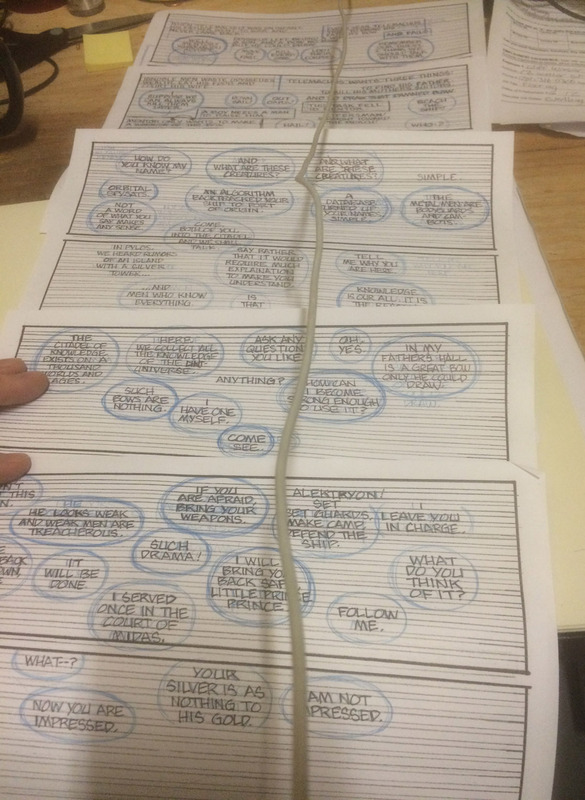 Then, I’ll paste in the scans of the rough lettering, leaving the balloons a solid blue color just as a placeholder. This saves me a little bit of time at the pencil stage because I’ll know where the lettering will be, and I won’t be drawing anything unnecessarily in those spots. From here, I’ll print a “low opacity” copy of this, and start penciling the figures, backgrounds, etc. right on this layout. 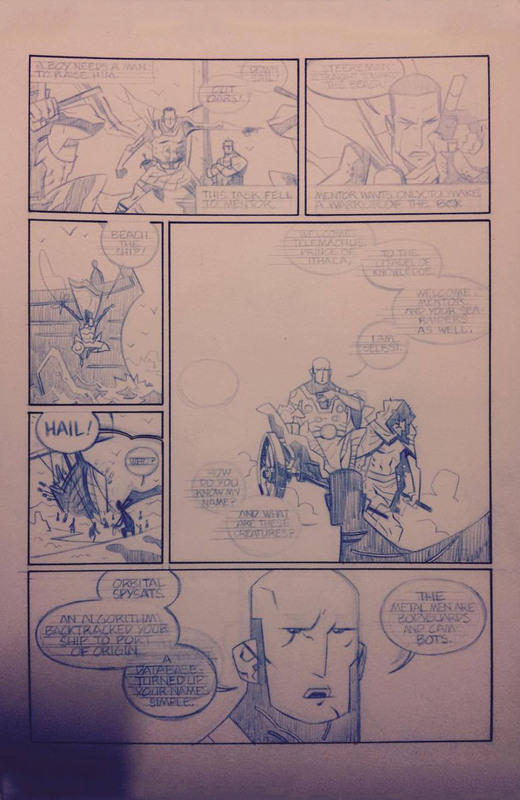 Now, I’ll take my rough pencils and lightbox the essentials onto my final boards (11” x 17” bristol), along with the lettering. This shot is pretty self explanatory. I’ll go through and ink the page with an assortment of pens, and fill in larger areas of black with a brush. I use the same pens to ink the lettering and balloons, and I’ll use white ink for any corrections or stray marks. When it came to coloring, we hit a couple snags. Eventually I asked Andrew and Chris (editors) if I could take on coloring duties, and they were trusting enough to allow me to do it. Everything was colored using Photoshop CS5. Flat colors usually work best with my art, so that was the initial idea. But I wanted something that made the work look a little older, and offered something slightly different. Which brought me to the “halftone/dot” pattern, like in old comic book printing. 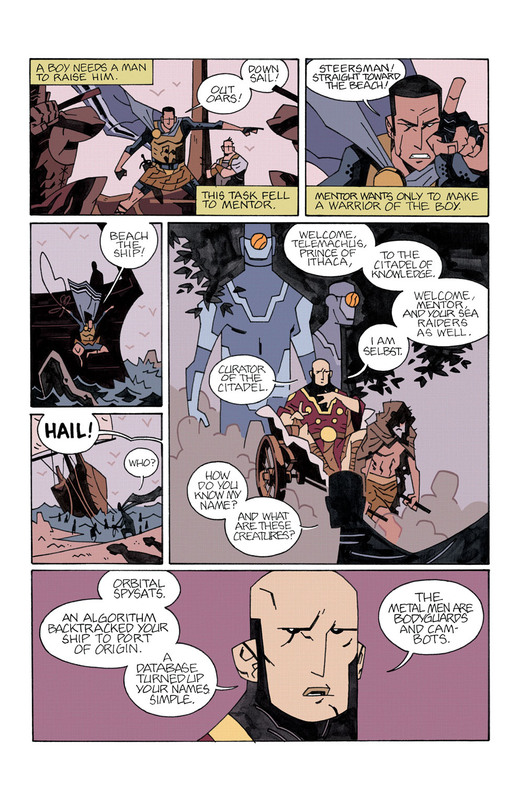 The halftone pattern also made it possible for me to unify the color palettes on each page. By lowering the opacity of the halftone layer, and making it a color that that fit in the page’s color scheme, I applied it like an overlay that made everything more cohesive. I feel incredibly lucky to have been involved in this project. Michael wrote a great story, and Andrew and Chris did a fantastic job gathering all these different creators to put together an amazing book. We hope you enjoy it. You can find Joe on Twitter, Tumblr, Instagram, and DeviantArt. Find Once Upon a Time Machine vol. 2: Greek Gods & Legends in comic stores April 11, from Dark Horse Books. Comic Book Resources has an exclusive preview of some beautiful art from Volume 2. 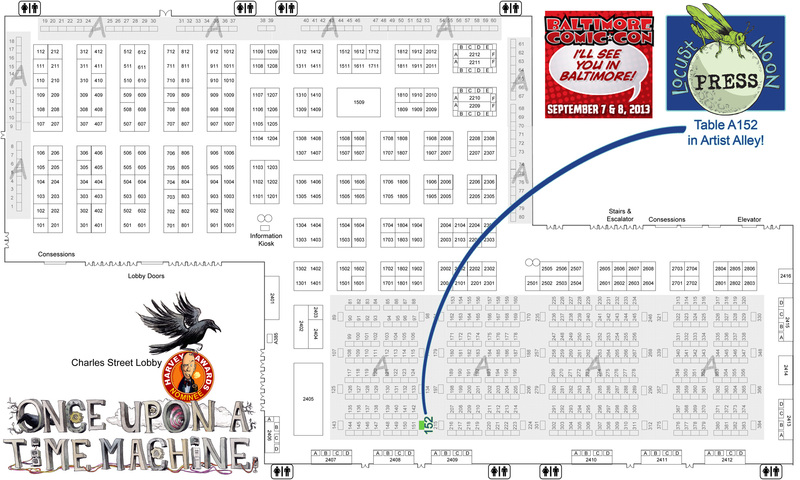 They’re showing off a couple pages each from the epic “Theseus and Metrotaurus” by Ronald Wimberly and “Game Changers” by Ben Kahn (script), Alexandria Huntington (art), and HdE (letters). Check out CBR’s preview here. Meanwhile, the book’s just starting to get some advance reviews. The first one’s short, but very sweet! The news is out! And this future ain’t too far away. Once Upon a Time Machine vol. 2: Greek Gods & Legends is in stores on April 11, 2018! “Ancient” Greece: the year 3016 AD. And 4079 AD. And 6060 AD. From the trials of Heracles to the love songs of Orpheus, the myths and gods of the past are reborn in wondrous and scarcely imaginable futures. 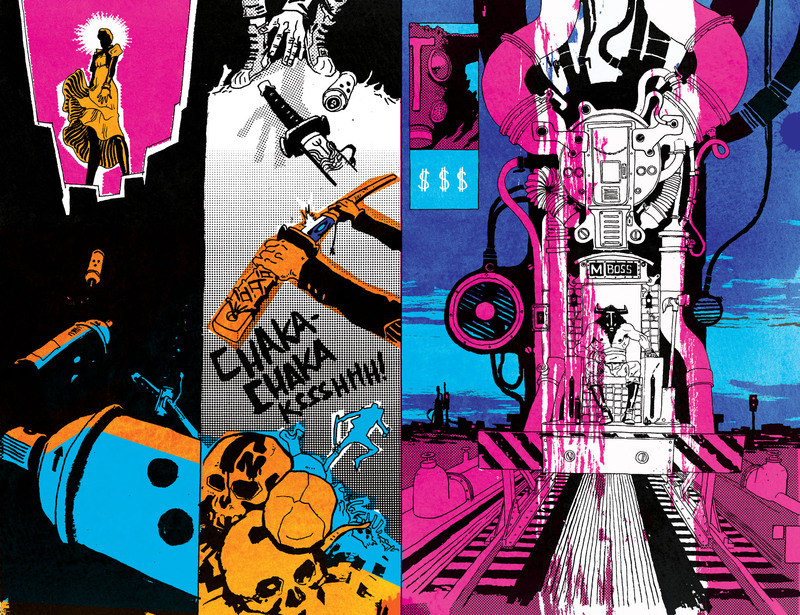 Witness exciting new visions of the Greek tradition from the hands and minds of Ronald Wimberly (Prince of Cats), Paul Pope (Battling Boy), Toby Cypress (The Gravediggers Union), Conor McCreery (Kill Shakespeare), Andrea Tsurumi (Accident! ), Hugo & Nebula Award-winning science fiction author Michael Swanwick (Stations of the Tide), and many more of today’s most inventive creators. Edited by Andrew Carl & Chris Stevens, of the Eisner & Harvey Award-winning Little Nemo: Dream Another Dream. On sale everywhere April 11, 2018, from Dark Horse Comics. See where you can pre-order it here. We finally added a hefty preview of the book to our website. For a while there, Facebook was the only place where you’d find a wide range of art from the Once Upon a Time Machine. But now you’ve got it here, too! So if you haven’t already picked up the book, go ahead and check out the “Preview!” page on our site to see what you’re in for. You can also read the full first story from Time Machine at Dark Horse’s website. Between con season, Locust Moon’s recent projects, and the two of those things combined, we haven’t been as good with online updates as we’d like. But you’ll be hearing more of us, I guarantee it! 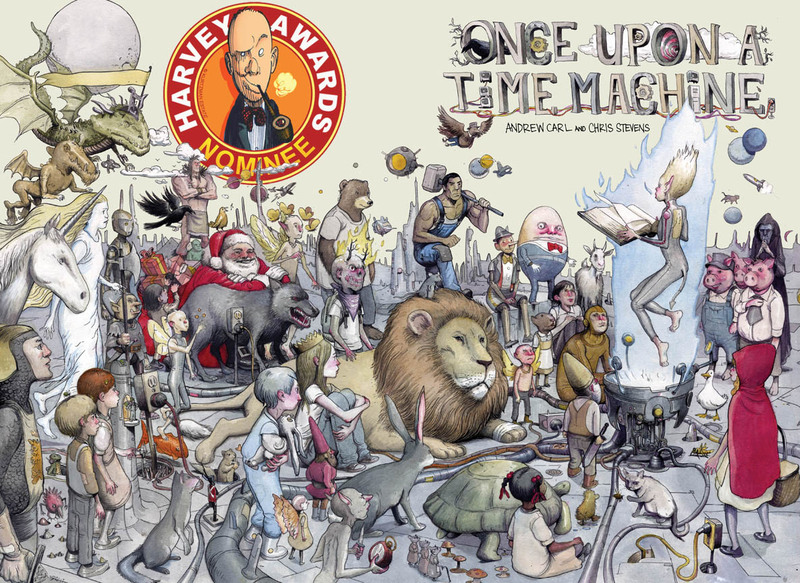 The nominations for the 2013 Harvey Awards were announced recently, and we were honored and humbled to find our book, Once Upon a Time Machine, nominated in the category of Best Anthology. We have to thank everyone who has supported us in buying the book, reading it, spreading the word and, of course, nominating it. For many of us involved, Time Machine was our first published work – and it took a lot of time, sweat, learning, and love to put it out into the world. We have been consistently overjoyed with the response the book has gotten, and this nomination is a big deal and great validation for what we tried and continue trying to do in comics. From everyone at Locust Moon and Once Upon a Time Machine, thank you again for all your love and support!